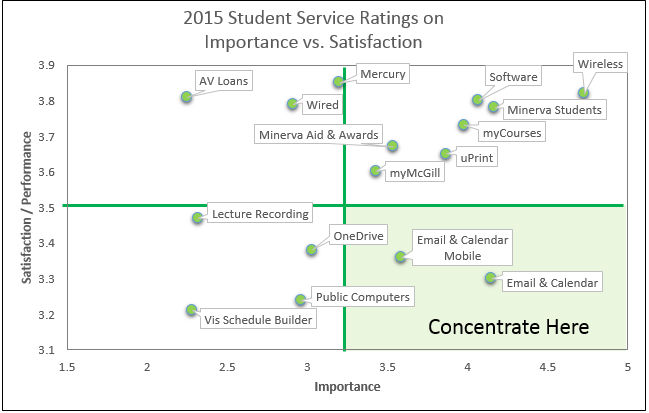 Students rated Email, myMcGill, Wireless, uPrint and Software high in importance (avg. > 3). However, many students ( 34% of grads said they were not aware of the OneDrive cloud file storage service from Office 365. Satisfaction for Software improved dramatically, from an average of 3.6 in 2014 to 4.23 in 2015. Satisfaction for Public Computers increased moderately, from 3.26 in 2014 to 3.53 in 2015. Satisfaction for Email and Calendar declined slightly, from 3.9 in 2014 to 3.5 in 2015. The importance rating for Mercury Course Evaluations increased from 3.09 in 2014 to 3.25 in 2015; satisfaction with Mercury was about the same. About one third of students (27% of Undergrads and 34% of Grad & Post Docs) reported they were not aware of the OneDrive cloud file storage service from Office 365. Ratings for Software increased in both importance (3.94 in 2015 vs. 3.87 in 2015) and satisfaction (3.79 in 2015 vs. 3.61 in 2014). Instructor ratings of Lecture Recording increased in both importance (2.33 in 2015 vs. 1.9 in 2015) and satisfaction (3.44 in 2015 vs. 3.06 in 2014). uApply, the graduate admissions system saw an increase in satisfaction (2.66 in 2015 vs. 2.18 in 2014). 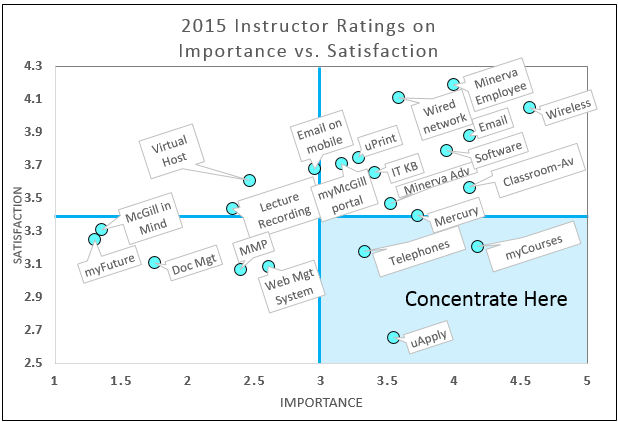 Instructors consistently expressed satisfaction and gratitude with the levels of support they received, at the walk-in office, over the phone and via email. Instructors' text-based responses were very varied, pointing to many specific needs for teaching technology in the classroom and outside; this indicates that they are increasingly using, and pushing the limits of technology in systems such as myCourses, OneDrive cloud storage and classroom audiovisual equipment. Approximately 30% of instructors responded that they use non-McGill provisioned cloud-based solutions such as Dropbox, Google Drive, Google Hangout, and other calendar/scheduling services. That percentage has dropped since the 2014 survey, where 70% of instructors responding that they were using these non-McGill provisioned services. Hopefully, this is attributed to McGill's offering of OneDrive for Business through Office 365. There was a noticeable decrease in satisfaction for Telephone service (3.17 in 2015 vs. 4.17 in 2014). There were no significant differences in importance or satisfaction for other services since 2014. IT Support satisfaction ratings were high for both IT Service Desk (telephone and email support) and on-site Desktop & Network support. 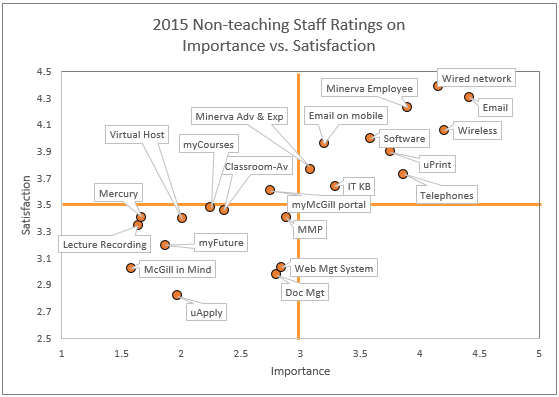 Non-teaching staff members reported that the Whats New @ McGill newsletter was an effective means of communication, as well as emails from their faculty/department. 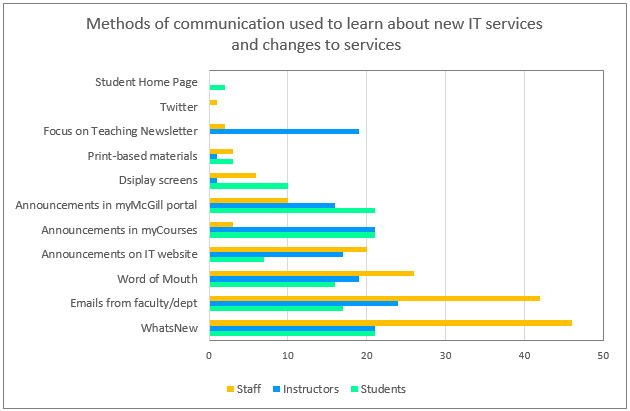 For instructors, emails from their own faculty/dept were the primary means of communication regarding IT announcements; WhatsNew @ McGill, Focus-on-Teaching and Announcements in myCourses were also cited. Students reported seeing IT announcements in myCourses and the myMcGill portal at least as much as they did via email and newsletters.